2014-15 Catalog and Academic Calendar - Now Online! In concert with the start of the 2014-15 academic year, Cazenovia College is pleased to announce the availability of the official 2014-15 College Catalog. Available via PDF and now in an enhanced web page format, the Catalog provides detailed information about Admissions, Financial Aid/Services, Campus Life, Academic Support, Policies and Procedures, Degree Requirements, Course Descriptions and more. 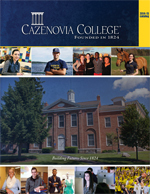 Visit www.cazenovia.edu/catalog to access this year's catalog. Also updated recently to better serve our students, families, faculty, staff and administration is the 2014-15 Academic Calendar. Visit www.cazenovia.edu/academics/academic-calendar to view the most recent calendar and/or to download/print the PDF version. Best wishes to all for a positive, productive 2014-15 academic year!